Since 1997, Newark Middle School sixth and eighth grade social studies teacher Lisa Eakins not only helped organize but attended four presidential inaugurations with groups of seventh and eighth grade students. Eakins, who also is the NMS social studies supervisor, spearheaded the first NMS student trip to Washington, D.C. two decades ago, and watched with students and staff chaperones as Bill Clinton was sworn into office President of the United States for a second term in 1997. She attended the first inauguration of George W. Bush in 2001; the second inauguration of President Barack Obama in 2013; and most recently, watched alongside 46 NMS students on the National Mall as Donald J.Trump was sworn in as the 45th President of the United States on January 20th. This most recent trip was the sixth consecutive inaugural trip NMS students have attended. The NMS contingent that had a great view of the proceedings as they stood near one of the jumbotron large screen televisions at a mid-way point on the National Mall included NMS teachers Matt Klemann, who teaches 7th and 8th grade social studies and served as the trip’s co-advisor with Eakins as he did in 2013. Klemann was the advisor of the trip to Obama’s first inauguration in 2009. The four other teachers who served as chaperones on the trip included: 7th grade math teacher Scott Briggs; 6th grade math teacher Jason Dentel; 7th grade English teacher Danielle Ohlsen; and 7th grade social studies teacher Christine Jacobs. Students attending the trip, and their grade levels, included: Arika Blaisdell (8), Alexandra Briggs (8), Jaston Brooks (8), Stevie Brown (7), Kalyna Bryant (8), Faith Clerveau (7), Jack Comella (8), James Crawford (7), Chariah Cunningham (7), Isaiah Dishaw (7), Allison Exton (7), Zoe Fisher (7), Benjamin Fisher (7), Jace Fredericksen (7), Rachel George (8), Jenna Havert (7), Michael Hermenet (8), Tyler Horton (7), Trent Horton (7), Meghan Johnson (8), Amber Johnson (7), Madison Jorgensen (7), Emma Kuhn (7), Emily Lang (7) , Kylie Lewis (7) , Adam Lombardi (8), Cody Luther (7), Zachary Mallette (7), Haley Miller (8), Megan Napoleon (7), Aiden Natale (7), Michael Oberdorf (7), Ethan Perrone (7), Kaleigh Pettit (7), Anna Renzi (8), Jacob Rodriguez (7), Taylor Serrett (7), Jayce Smith (7), Kristy Sulkowski (8), Gabriella Taylor (7), Benjamin Treese (7), Simon VerMeersch (8), Kylar Vermeulen (8), Jackson Vermeulen (8), Trinity Wells (7) and Emilena Wilck (7). In hopes of attending the trip, students applied more than a year ago and were elected based on their applications, academics, behavior and letters of recommendation. Students selected participated in several fundraisers to help cover the $500 cost apiece of each student attending the trip. More importantly, students, irrespective of differing political viewpoints, were prepared for the trip in social studies classes for months by learning about the lengthy electoral process including the primaries, conventions, debates, the election, the Electoral College, the smooth transfer of power in America and more. 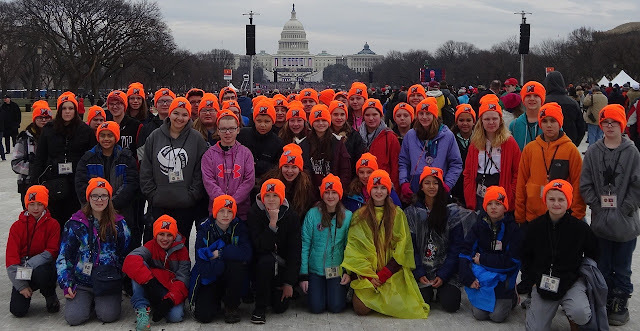 Once in Washington, the students all wore neon orange hats so they could be easily identified and counted. Eight students were assigned to each chaperone. “The kids were outstanding and enjoyed the experience and from what we’ve heard from parents since the trip, they said it exceeded students’ expectations,” Eakins said. Students are now preparing individual projects about their three-day adventure in the nation’s capital that will be on display at an evening event from 6 to 7 p.m. in the NMS library. Besides excitedly telling Klemann Jan. 20th that it was “the best day of his life” at the inauguration, eighth grader Kylar Vermeulen said the cruise on the Potomac was “a lot of fun” and his favorite part of the trip. “We got to experience a part of history that doesn’t happen everyday,’’ he said. Students also got to see the motorcade that included the car then President-Elect Trump and President Obama rode in to the inauguration. “It was really cool! Most of us thought we saw the back of Donald Trump’s head,’’ Jackson said. Like his brother he also liked the 2½ hour cruise and also said he really liked the air and space museum. Eighth grader Michael “Ryan” Hermenet said that attending the inauguration was the high point of the trip for him. Hermenet who has not been to Washington, D.C. before, said it was much different viewing the various memorials in person rather than seeing pictures of them. Eighth grader Haley Miller said she hadn’t decided yet whether the cruise or visiting the air museum was the favorite part of her entire trip. She also said the inauguration speakers initially seemed boring until she saw “familiar faces” like Obama and Trump. “That was pretty exciting,’’ she said. Despite students “being on both sides politically, both sides were excited to witness the transfer of power and see both Presidents. It seemed like every student was excited. It didn’t matter about politics,” Klemann said. Before the trip a few NMS students and staff were interviewed by area news media representatives about their upcoming trip. 0 Comments to "Newark Middle School Students Attend Presidential Inauguration"